When I first started baking, scones were among the first few recipes that I tried and tested. 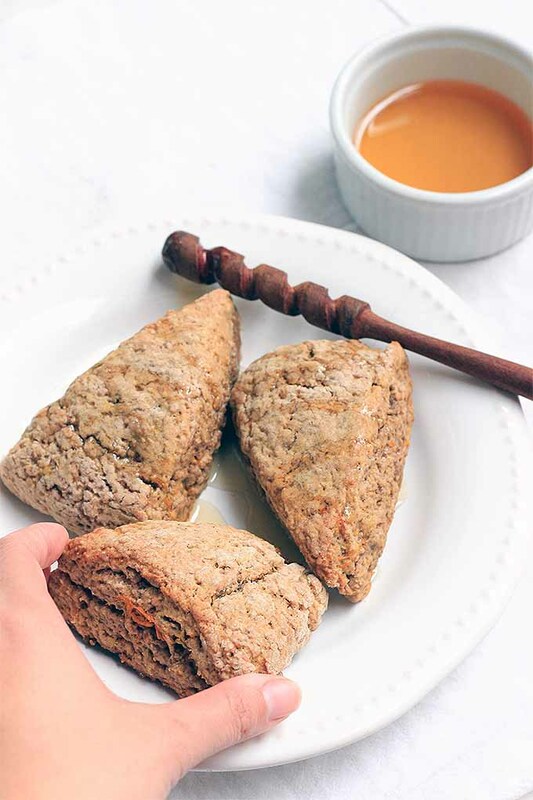 I loved the simplicity of scones, and how easy they are to make. 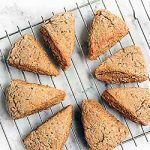 In my opinion, scones are the perfect sweet snack – great for accompanying a hot cup of tea or coffee in the afternoon, and for satisfying your sweet tooth. 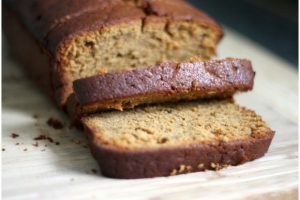 Naturally, when I was living in the US last fall and pumpkins were everywhere, I knew that I had to make a batch of pumpkin spice scones that featured the flavors of this popular winter squash, and warming spices as well. I remember savoring them the moment they came out of the oven, eating one after the other because they were just too good for me to stop. 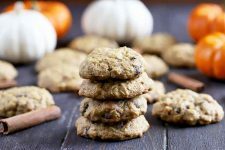 These pumpkin spice scones are a constant reminder of that fall in the US, and today, I want to show you how easy they are to make. 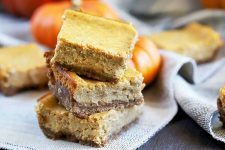 If you’ve already had enough of those overly sweet pumpkin desserts (pumpkin pie or pumpkin cheesecake, anyone? 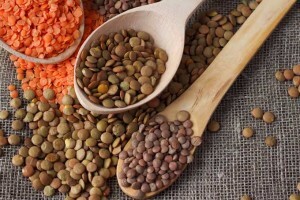 ), but still want to make use of the bounty of the harvest, I can assure you that this recipe is your answer. 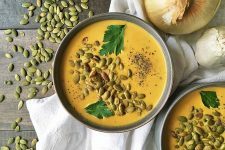 Plus, we have other more savory pumpkin recipes in spades – such as pumpkin hummus, soup, nut bread, and even pumpkin curry. 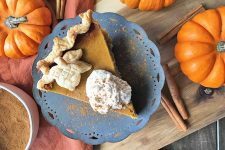 And if you don’t like pumpkin (try some of these recipes before your decide for sure), you may love our fresh blackberry, grapefruit oat, or caramel apple options. 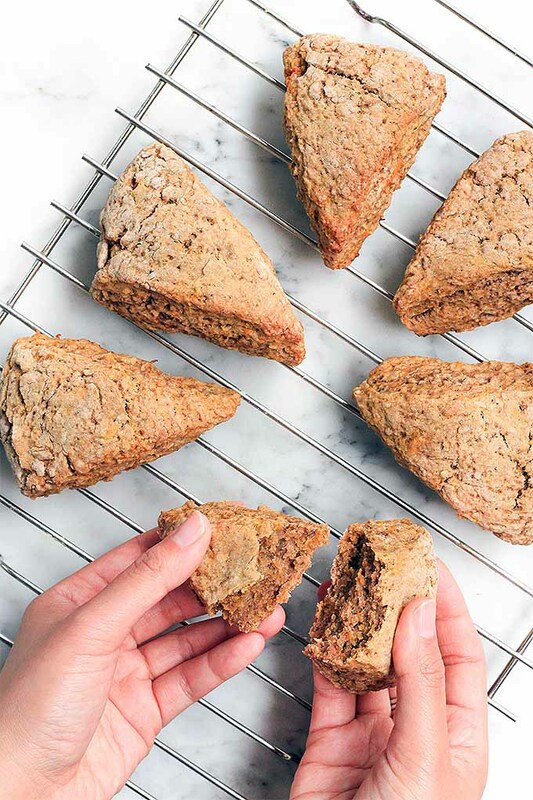 If you’ve never made scones before, don’t be afraid. 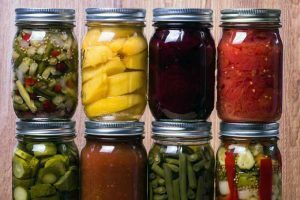 They’re really much easier than they may seem to whip up in your own kitchen. When baking, it’s important to consider how you work the dough, and to knead it well until it comes together. Here in Argentina where I currently live, people say you have to “amasar con ganas” – which literally means to knead the dough with desire, or better said, with intention. 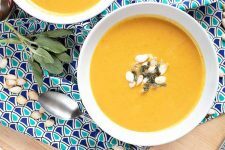 The trick is in combining both the dry and wet ingredients together and then kneading the dough until it is smooth and can easily be shaped into a circle. 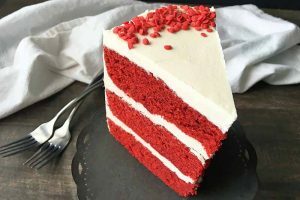 Once that’s done, all you need to do is to cut it into pieces and bake. I like to shape mine into triangles, but you could just as well cut out circles instead. That’s how easy it is to make scones. Ready to bake a batch right now? Let’s go straight to the recipe! 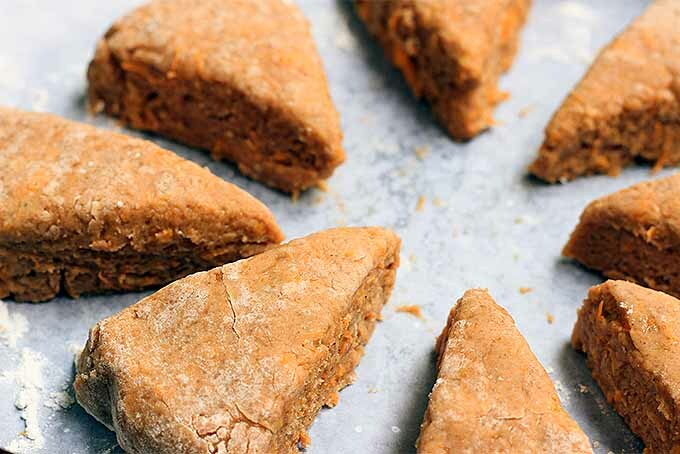 These moist, soft pumpkin spice scones are just sugary enough to satisfy your sweet tooth. 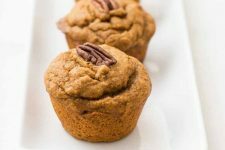 Perfect for breakfast or alongside your afternoon cup of coffee. Whisk the flour, brown sugar, baking powder, salt, cinnamon, nutmeg, ginger, and cloves together in a large bowl until combined. 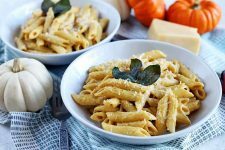 Grate the butter with a box grater and scatter it over the flour mixture, cutting the butter in with a pastry cutter or two knives until you get a sandy texture that resembles cornmeal. 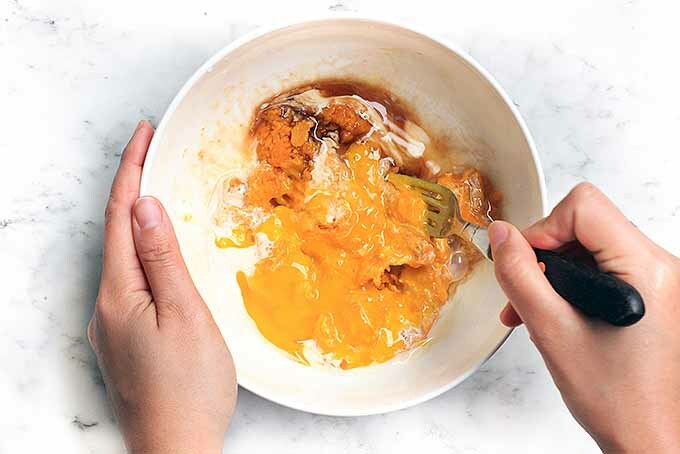 In a separate bowl, combine the pumpkin puree, honey, heavy cream, egg, and vanilla and whisk well until the ingredients are blended together completely. 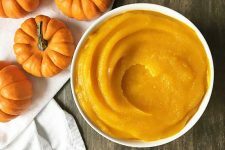 Pour the pumpkin mixture into the flour mixture and stir well until you get a soft dough. It will still be quite crumbly. 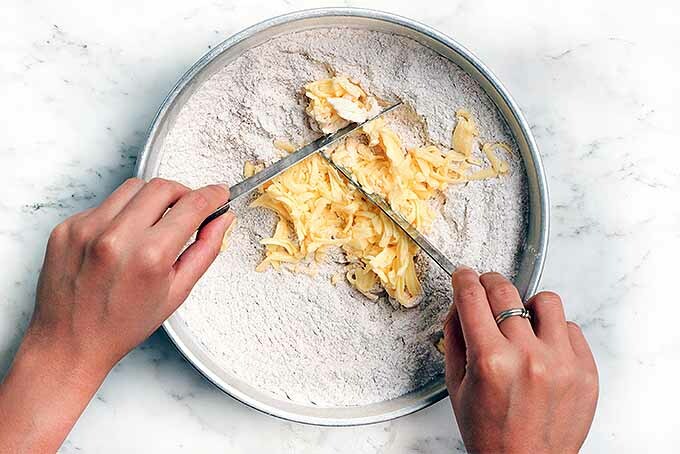 Transfer the dough to a floured piece of parchment paper and knead it well with floured hands until it comes together. Use your hands to shape it into a circle about 2 inches thick, and then slice it into 8 even triangles. 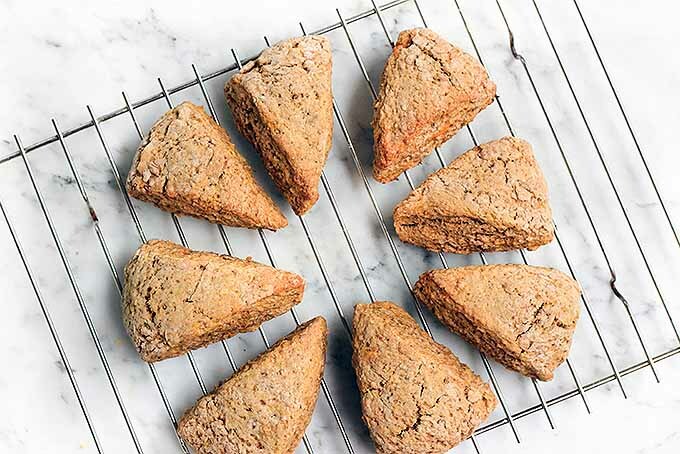 Transfer the parchment paper with the dough triangles onto a baking sheet and bake on the middle rack of the oven for 12 to 15 minutes, until the scones are golden brown and a toothpick inserted in the center of one comes out clean. Let the scones cool for a few minutes a wire cooling rack before serving. It’s important to read through the entire recipe and make sure you have everything you need. 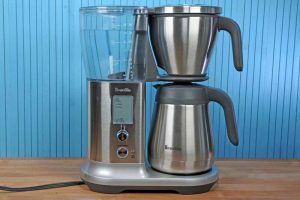 Assemble all of the necessary cooking equipment, and measure each of your ingredients, both wet and dry, so they will be ready to go. 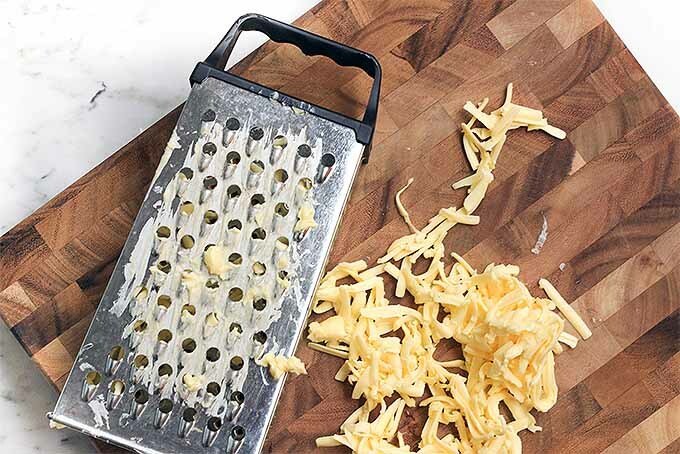 Grate the butter with a box grater and scatter it over the flour mixture. Cold butter is best. 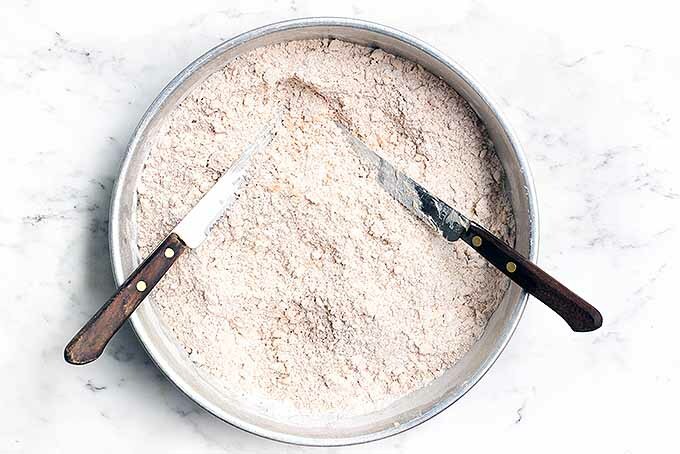 Cut the butter into the flour with a pastry cutter or two knives, until it resembles cornmeal. In a separate bowl, combine the wet ingredients. 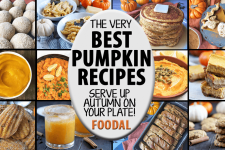 Add the pumpkin puree, honey, heavy cream, egg, and vanilla. 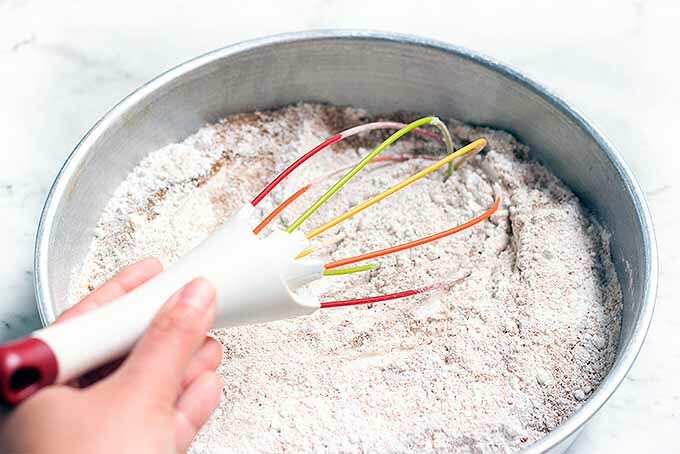 Whisk until combined completely. Pour the pumpkin mixture into the flour mixture, scraping the bowl with a rubber spatula so you don’t miss any. Stir well until a soft, crumbly dough forms. 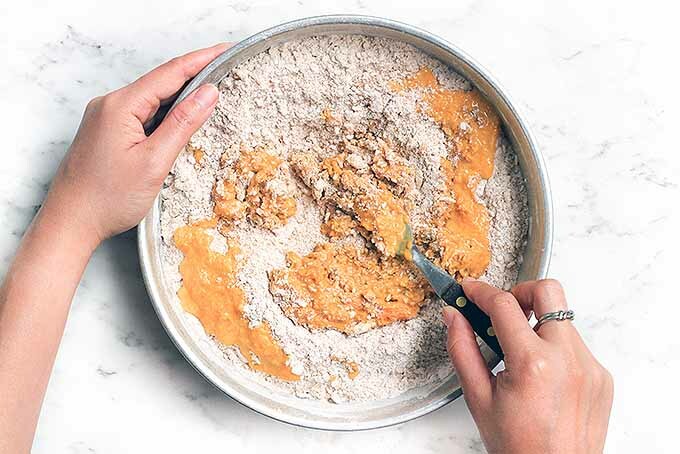 Transfer the dough to a floured piece of parchment paper, and knead it well with floured hands until a smooth dough comes together. 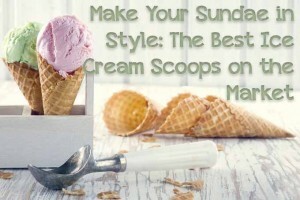 Be careful not to overwork the dough, or your final product will not come out light and tender. 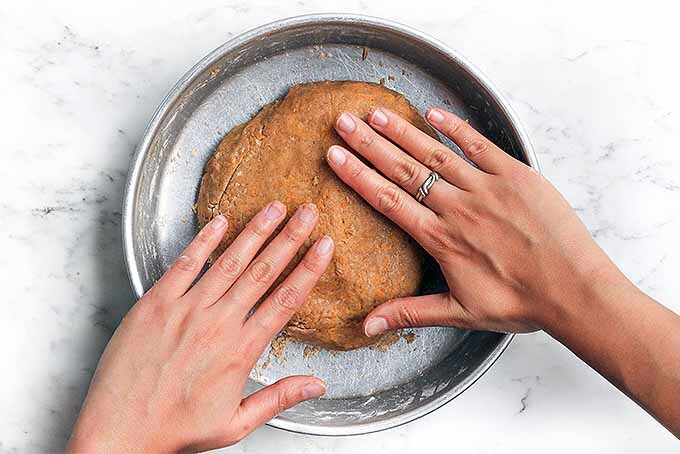 Use your hands to shape the dough into a circle that’s about two inches thick, and then cut it into 8 even triangles (the way you would slice a pizza). If you prefer, use a floured cookie cutter to cut it into circles instead, and push the remaining dough back together to continue cutting circles out until you have used it all up. 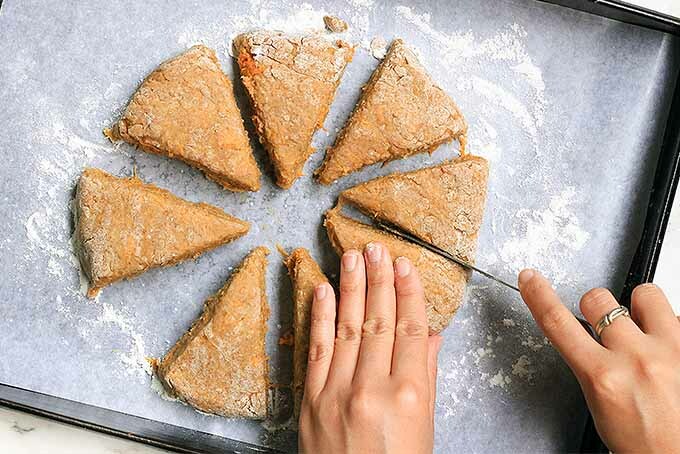 Transfer the parchment paper with the dough triangles onto a baking sheet. Place the baking sheet in the middle of the oven and bake for 12 to 15 minutes, or until the scones are golden brown and a toothpick inserted in the middle comes out clean. Let the scones cool on a wire rack for a few minutes before serving. 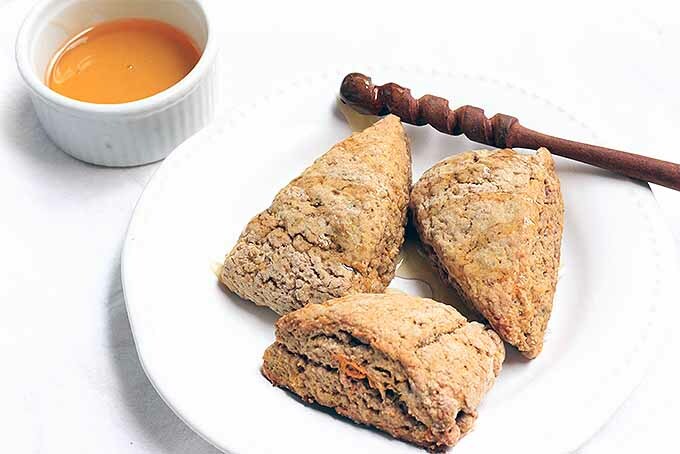 In my opinion, these scones are amazing on their own, or served with a smear of butter. 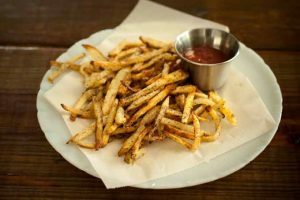 But if you prefer to sweeten them up a little more, you can always drizzle on a bit of honey, or some other type of glaze of your choosing. 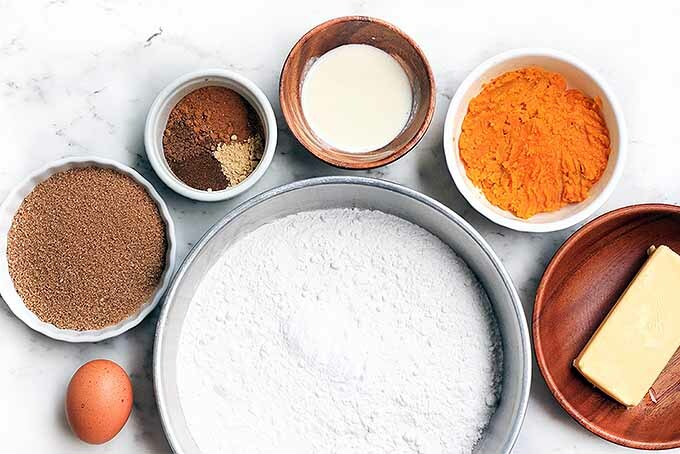 Try a simple confectioner’s sugar icing with a touch of vanilla extract or orange zest. 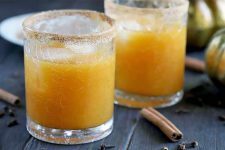 Or use our super easy spiced glaze, that you can make with freshly ground spices. 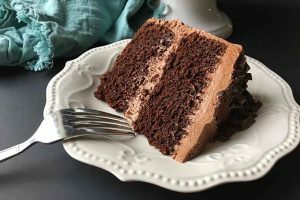 Not only will a drizzle of honey or sweet sugar glaze increase the flavor impact even more, the beautiful presentation will also impress your guests. 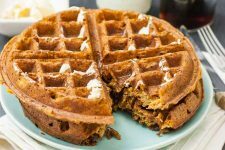 If you’re a fan of this cinnamon pumpkin treat, you may like our gooey brioche cinnamon rolls recipe! Give it a try. 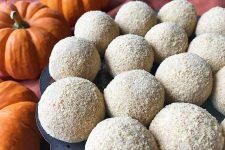 What other types of sweet pumpkin treats do you like to make at home? Let us know in the comments below!